Recently I was given the opportunity to review ScreenFlow 5 for MyMac.com, so I jumped at the chance. I had bought a previous version of ScreenFlow in a bundle, then did nothing with it. Now I would have to take some time and learn how to use the application. I’m so glad I did. When most people think of recording screencasts, ScreenFlow comes to mind, and with good reason. 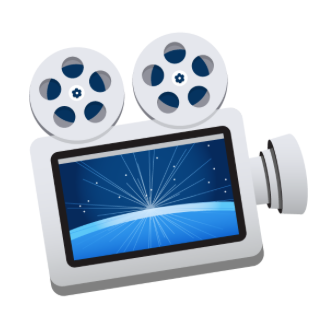 While iMovie or QuickTime are adequate for simple projects, ScreenFlow offers extra features that will bring your recording to another level. Let me give you fair warning first: ScreenFlow has a major learning curve. Like Final Cut Pro, Photoshop, Logic, and other intensive software, don’t expect to master this application overnight. I barely scratched the surface of what ScreenFlow can do. That said, I tremendously enjoyed playing with recording settings and using many of the post-production features that I demonstrate in a few demo videos below. When you open ScreenFlow you’re greeted with this screen. 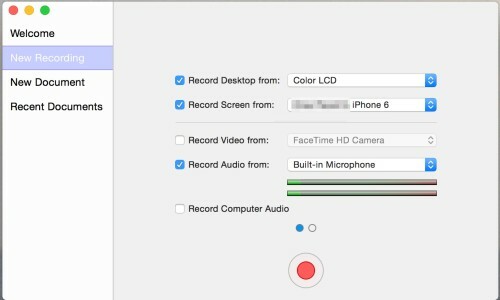 You can record from up to five sources at once: desktop video, video from a connected camera, computer and/or microphone audio, and, new to ScreenFlow, video and audio from a connected iPhone or iPad using iOS 8. Once you choose your inputs, the New Document screen allows you to either customize the size of the screen capture, or select one of 11 presets. Recording from an iOS device takes a little getting used to. You can’t see the capture within ScreenFlow, but rest assured, it’s there when the recording is completed. Below is a screencast I made using my iPhone 6. After it was edited I realized I didn’t select iOS Capture-iPhone 6 Portrait in the New Document settings, which is why the phone is on the right side of the screen rather than centered. As I said earlier, there’s a lot to learn! 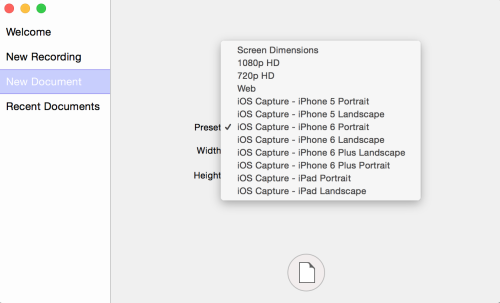 When creating a screencast with an iOS device, it’s helpful to the viewer to see where it’s necessary to tap or swipe on the device. ScreenFlow added Touch Callouts, little circles that demonstrate where on the device I would touch or swipe to perform a particular action. 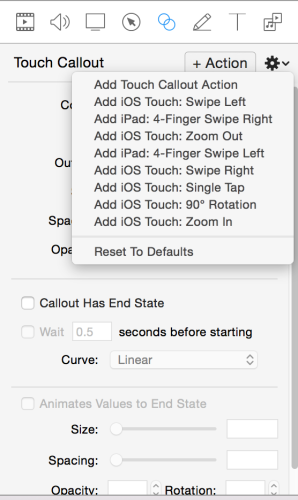 I had planned on using Touch Callouts in the iPhone video above, but I had difficulty using them. Again, there’s a learning curve involved with ScreenFlow, especially if you’re new to the application. If you’ve used GarageBand or iMovie in the past then editing in ScreenFlow will feel very familiar. Like GarageBand and iMovie, ScreenFlow has drag and drop capability with iPhoto and iTunes through the Media Library tab in the editor. The magic of ScreenFlow is in the editing. Speed up or slow down clips. Highlight the mouse pointer. Or not. Change the size, color, opacity, shadowing of callouts, texts, or annotations. Overlay the modifier keys on the video as you say the words. Zoom in and out to emphasize significant elements of the screencast. I was amazed at all the choices I had available to make my screencast exactly what I wanted it to be. Actions are an important component of ScreenFlow. 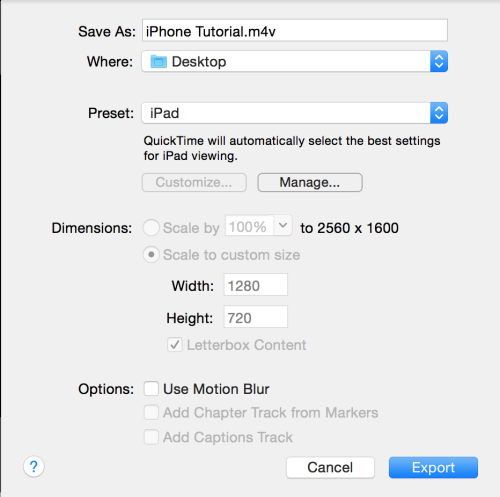 Actions are property changes; for example, zooming in on video or ducking audio. New to ScreenFlow are Snapback Actions, which will bring the screencast back to the state it was in before the action was applied. 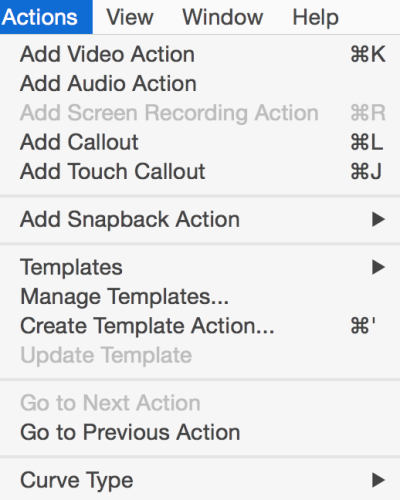 If you find you’re using the same action over and over again, audio or video, you can now create Action Templates. Here’s another ScreenFlow video, a simple Mac Safari tip. Each video took me about one hour to create, not too bad considering ScreenFlow was a completely new experience. Yes, it’s rough around the edges, but it displays the power and versatility of the application, plus how effective it is to show rather than just tell in many cases. Experienced users would create the same video in less time; newbies might need a little more time. It really depends on how quickly you learn and understand ScreenFlow and how in depth you’d like your video to be. ScreenFlow offers direct publishing options to many online services, including YouTube, Google Drive, Dropbox, and Facebook. Or you can export and save the file to your computer, choosing from various presets, plus the newest option, App Preview, for use in the iTunes or Mac App Stores. If you need to export many videos with the same settings at one time, the new Batch Export selection is a huge time saver. Overall, ScreenFlow 5 is an incredibly powerful application that is a must have for anyone who creates, or is even thinking about, creating screencasts of any kind. It does so much more than I could possible fit in this review; some features I have yet to discover. There’s plenty of documentation on Telestream’s web site in the form of user guides, videos, how-to’s, webinars, and forums to help turn even the most basic user into a power user. Download a free trial of ScreenFlow, then get ready to have some fun. MyMac.com Review Rating: 9 out of 10. Again, be prepared to take the time to learn ScreenFlow to get the most out of it.